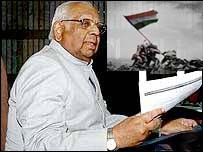 23 July :A defiant Lok Sabha Speaker Somnath Chatterjee was expelled by CPI(M) in the wake of his refusal to quit the post in line with the directive of the party with which he was associated for four decades. "The Polit Bureau of the CPI(M) has unanimouisly decided to expel Somnath Chatterjee from the membership of the party with immediate effect," a Polit Bureau statement said after its meeting chaired by General Secretary Prakash Karat, that discussed his defiance ever since the party withdrew support to the UPA government.The party invoked Article 19 (13) of its constitution to expel him under summary procedures without any notice on the charge of "seriously compromising" the party position. In the last fortnight he had been maintaining that he would take an appropriate decision, but it became increasingly clear that he was not going to oblige the party diktat. After persuasion by CPI(M) patriarch Jyoti Basu and others failed, the party is understood to have deputed one of its senior leaders Biman Bose to tell him that he give up the post in the light of the changed situation. The CPI(M)’s decision on Wednesday may be the first of its kind in the country where a party severs its links with a person in such a post. Chatterjee, the first Marxist to become a Lok Sabha Speaker, had been a member of the Lower House since 1971 except for a short break in 1984 when he lost to Mamata Banerjee. He returned to the House in a bye-election.The Speaker declined to comment on the decision. While leaders of the Left parties attacked the Speaker, the Congress and its ally RJD spoke highly of his conduct as a presiding officer.Congress spokesperson Jayanthi Natarajan said Chatterjee has been an "exceptionally good" Speaker who has been fair. "In any parliamentary democracy this is unprecedented," she said referring to the CPI(M) decision.Senior RJD leader and Union Minister Raghuvansh Prasad Singh described CPI(M)’s decision as "ridiculous and unfortunate".